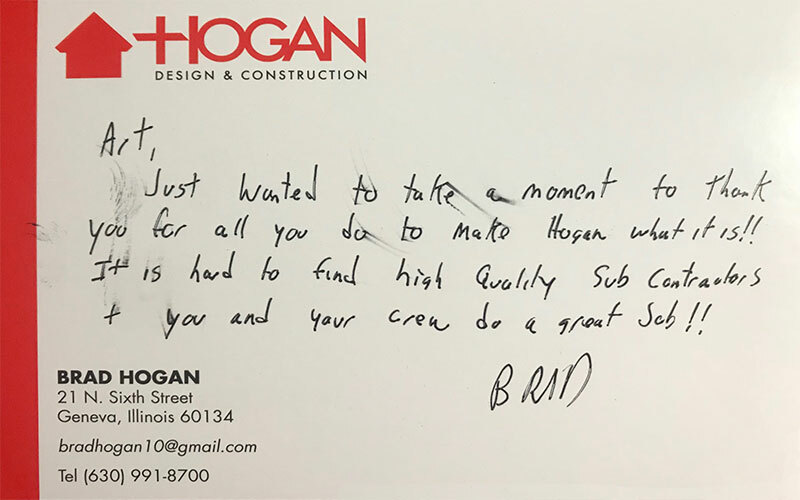 Art – Just wanted to take a moment to thank you for all you do to make Hogan what it is!! It is hard to find high quality sub contractors and you and your crew do a great job!! Hi my name is Tracey Madden and I worked for Douglas Flooring in North Aurora, IL. I am a flooring consultant for the company and have been in the trades over 20 years. I run their professional services dept and work on the retail floor at our Douglas Carpet One showroom. In our professional services, I have the pleasure to work with Art Zieba. Our Professional services works with trades people and give them the edge to purchase products from us on a whole sale basis. Art is one of our Number One Customers and truly respected when he comes into our establishment. In the professional services, we line our contractors with top note installers and Art has proven that he and his company can do the best job! I have been in the trades for over 2 decades and I’am truly amazing with the quality of work that is done at some an amazing price. Art’s team not only does a fabulous job also and they are dependable and very professional. Art offers a wide range of flooring installations. His truly passion is tile, but he can install wood, laminate, vinyl tile as well as finish hard wood floors. Which Is a great ascent to the contractors, they have one person to go to!!! If you are currently looking for a professional to install your flooring, do not hesitate in hiring him!! You will not be disappointed! !